Although so-called millennials are on track to be the most educated generation in American history, they are still lagging behind their international peers in critical skill areas such as literacy, numeracy and problem solving in technology-rich environments, according to a new report. The report, â€œAmericaâ€™s Skills Challenge: Millenials and the Future,â€ takes a closer look at Americans born after 1980, ages 16-34, and finds that not only do they lag behind those in other countries, the numbers show millennials are lagging behind previous surveys of U.S. adult skills. Researchers drew from data from the Organisation for Economic Cooperation and Developmentâ€™s Programme for the International Assessment of Adult Competencies, (PIAAC). The researchers looked not only at the lower quartile of Americans, as in previous PIAAC work, but also found alarming results for the best-educated U.S. millennials as well. The answer is not simply to acquire more education, the authors argue, but rather a greater focus on skills in order to combat growing inequality for current and future Americans. In literacy, U.S. millennials scored lower than 15 of the 22 participating countries. 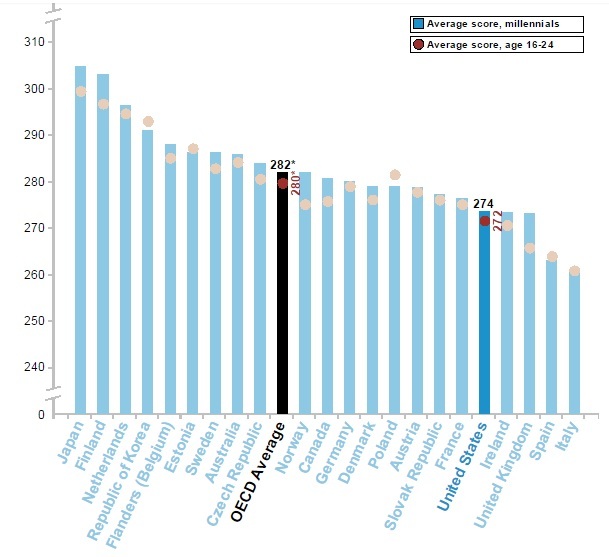 Only millennials in Spain and Italy had lower scores. In numeracy, U.S. millennials ranked last, along with Italy and Spain. In problem-solving in technology rich environments, U.S. millennials also ranked last, along with the Slovak Republic, Ireland, and Poland. The best-educated U.S. millennials â€” those with a masterâ€™s or research degree â€” only scored higher than their peers in Ireland, Poland and Spain.